Kay was born and raised in Aberystwyth, Wales. She was educated at Llandysul Grammar School and went on to study Biochemistry and Microbiology at King's College London, followed by a Ph.D. in medical research and an MBA from the University of Surrey. Kay was elected as the Conservative MEP for Wales in June 2009. 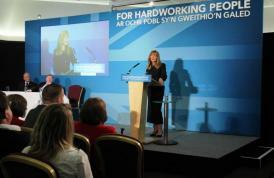 This saw the Conservative Party top the elections for the first time in Wales in modern history. A successful career in investment banking has equipped her with in-depth knowledge of the global financial markets. This, combined with her experience advising businesses in Europe and the US, has led to her appointment on the Economics and Monetary Affairs Committee in the European Parliament. At present, Kay is deeply concerned about how quickly the European Union is responding to financial service regulation without having properly looked at the impacts of what it is doing. She believes that the EU should work within a global framework as the crisis that we are facing is global; therefore it needs to work with the United States and so a global co-ordinated strategy needs to be implemented that is in line with the agenda of the G20. Kay's main political priorities in Wales include fostering economic vitality through sustainable investment and improvements in rural support. She has been working towards creating a strong, stable Welsh economy which looks to encourage and support trade and businesses, particularly SMEs who are fundamental to economic recovery.